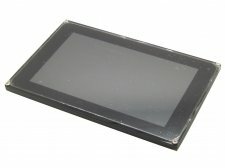 The HY070CTP-HD 7 inch LCD Module is designed to work with HAOYU Electronics's ARM development boards and MarsBoard's single board computers. It has one 7 inch TFT LCD including capacitive touch screen with 1024 by 600 pixels resolution. RGB signal interface is compatible with HY050CTP-HD, HY070CTP, HY101CTP, LVDS signal interface different with HY101CTP. LCD display timing is compatible with HY101CTP, capacitive touch driver compatible with HY050CTP-HD, HY070CTP, HY101CTP, but HY101CTP capacitive touch Y axis polarity different with HY070CTP-HD.